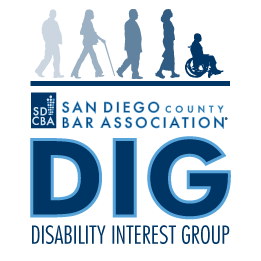 The SDCBA has created a disability interest group that will meet monthly to discuss disability related matters, organize presentations, and foster mentorships with interested groups on disability topics. Membership is for SDCBA members. Attorney participants will be required to undergo school vetting for mentoring of students. A 2013 ABA survey of attorneys reveal 8% reported an acknowledged disability. However, a national law firm poll, to which 110,000 attorneys replied, only 255 (0.23%) reported they had disabilities. People with disabilities have faced historic discrimination as noted in the 1990 legislative history of the Americans with Disabilities Act. The profession has been slow to eradicate barriers for those interested in a career in law, and for attorneys with disabilities entering the legal profession. Yet, attorneys with disabilities serve their clients and community well. Bring SDCBA members together who are interested in disability rights issues, or who have disabilities, to foster collaboration, professionalism, and creation of new relations and community. The group will strive to raise in the legal community awareness of issues facing those with disabilities, and to emphasize the necessity for accommodation. Further outreach to groups includes but is not limited to schools of all educational levels, local community organizations, employers, potential clients, and MCLE. The focus is to promote law as a viable career choice for those with disabilities, and to bring appropriate awareness and accommodation when working with an individual who has a disability. This group offers SDCBA members a meaningful way to make connections, raise awareness, and generate understanding on how to accommodate individuals who have disabilities. The more connected SDCBA members become, the stronger, more diverse and more professional the organization becomes.